Jawf and Nawf were camels that looked exactly the same. They were twins. They snorted the same snorts, kicked the same kicks, and even spit the same way. Their humps were the same size, as were their tails. They both had long, thick eyelashes and a coat of wiry, light brown fur. 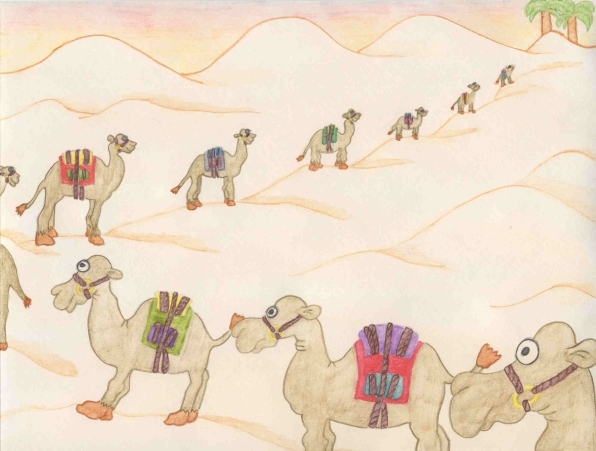 The two camels were part of a large camel train that walked along the Incense Trail – a path that ran across the Arabian Peninsula to Egypt, Turkey, the Holy Land, and other countries. The camels worked hard, walking for many miles each day, but always seemed to be cheerful about it. Sometimes they would go for days without a drink of water from a refreshing oasis. Camels can do that. There were so many camels in the camel caravan that even though they were tied together, the line was nearly a mile long. Jawf and Nawf didn’t mind. They were happy that way. They were together and that is how they liked it. Jawf wore a red blanket and carried bags of frankincense, which had been harvested from scraggly trees found only on the eastern side of the great desert of Arabia. It was rare and expensive, and sought after by the kings of far off lands. It was burned as incense, used for healing purposes, and desired as a fragrance. Nawf wore a green blanket. He carried something just as rare and precious in the bags thrown across his back. They were filled with ‘Diamonds of the Sultans’, or ‘Desert Diamonds’. Tribesmen spent many hours each day sifting through the scorching sand for them. They weren’t true diamonds, but looked similar and lasted as long. The pharaohs and their wives wore them as jewels around their necks, ankles and wrists. Jawf and Nawf had been in the camel caravan for many years. They knew the route well. Usually, if it was summer, they traveled at night, when it was much cooler. Jawf and Nawf enjoyed traveling after sunset. They could see all the stars sparkling and twinkling in the midnight sky, and could see where they were stepping by the light of the shimmering moon. One morning, as the sun rose above the horizon, the caravan stopped at an oasis. The men who looked after the camels during the journey were called brides. When they un-roped all the camels, Jawf and Nawf wandered over to the springs that bubbled up from the sand. A sheik lived nearby, in a large black tent. It was made of goatskin. As the twins walked past, they saw that the tent was filled with cushions and pillows. Some were large, some were small, but they were all bright colors and had beautiful designs embroidered on them. The sheik was resting on one of the larger pillows. He was wearing a lot of gold jewelry around his neck, wrists, and on his fingers. Goats and sheep ran in and out of the tent. Nawf and Jawf drank and then found a shady acacia tree to rest under. Nawf fell asleep. As Jawf sat there, several scarab beetles crawled past him. He wanted to eat one of the metallic green bugs, but when one of the brides walked by with a large wooden bowl full of dates, Jawf decided they looked tastier. He stood up and wandered off to look for a date palm. While he was gone, Nawf woke up. He yawned and looked over to where Jawf was supposed to be. He wasn’t there. Nawf stood up and looked about. Where was Jawf? He walked around the oasis. He went down to the springs to see if Jawf had gone for another drink, but he wasn’t there either. He went past the sheik’s tent and peeked inside, but there was no sign of Jawf, only the sheik and a few goats. He searched and searched, but couldn’t find his twin. Nawf had an idea. He let out a loud screeching sound, calling to Jawf. He heard nothing back, so he did it again, only louder. This time he heard Jawf answering him. He kept calling to his brother and followed his noisy answer. Soon he found Jawf standing under a date palm. He was kicking it with his powerful hooves, trying to knock dates down. Nawf, relieved to find Jawf, started kicking the tree too. Suddenly dozens of ripe dates fell to the sand. The camels picked them up with their teeth and chewed them up. They went to get another drink from the oasis and as they were standing, lapping up water, the bride came along and tied a rope around their necks. It was time to leave the oasis and continue their journey. The sun was setting and it was finally cool enough to leave. Their backs were loaded high with frankincense, myrrh, and desert diamonds. Off they went, headed toward Egypt and the next oasis.